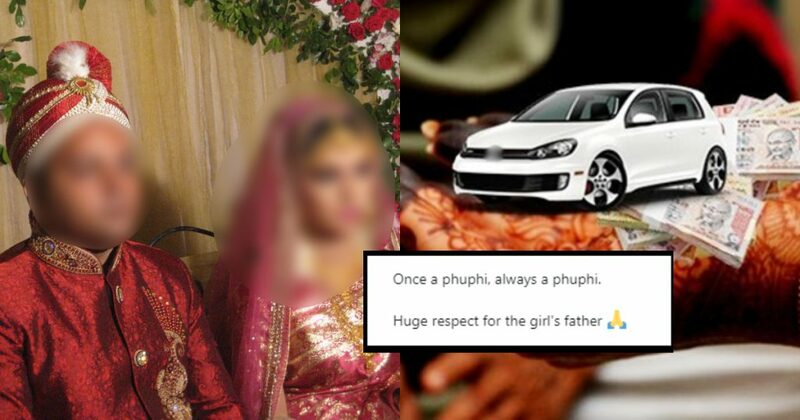 A Pakistani Father Called Off The Wedding Of His Daughter With Her Cousin After The 'Phuppo' Demanded A Car! A Pakistani Father Called Off The Wedding Of His Daughter With Her Cousin After The ‘Phuppo’ Demanded A Car! Currently, we are living in a world where we are driven by materialism rather than delicate morals and ethics. Pakistan, the country where ethical norms are practised with a great spur is also encompassing with the growing abuse of materialistic approach. A recent tweet on Twitter by a lady exhibits the very nature of greed-driven Pakistanis. In a tweet, the lady narrates an incident where going to be a mother-in-law of a bride asked bride’s, father, to gift her son a car on a wedding stage! According to the tweet, the greedy lady was also the aunt (PHUPPO) of the bride. However, the father of the bride took a rational and a brave action and broke the ongoing marriage on the spot. The very soul of the marriage is love, empathy and respect not the money or any materialistic good. Therefore, any virtuous and astute father would have done the same if it had happened to his daughter. This sad incident depicts the mentality of the people around us. Being a Muslim one must not succumb to worldly goods. The menace of globalisation is obliterating the delicate norms of our society as well as cardinal principles of Islam. This due to the fact that people rely more on corporal need, rather than spiritual ones. The culture of taking dowry is ruining the Pakistani society. Although Pakistan is an Islamic country, the denizens follow the culture which is 180 degree opposite to Islamic teaching. Nowhere in Islam, the practice of dowry is appreciated. In reality, Islam exhibits the notion of giving to women and not taking from her. Her father is a real life hero. Once a phuphi, always a phuphi. Sadly, I hear this happening quite often and the girls’ family in most cases feel pressured to oblige instead of looking at from a different perspective that this could be the start of a materialistic and horrid relationship that can cost their daughters life. I thought this happened in films only….these demands? To our utter dismay, being Muslims and Pakistanis, we have failed in alleviating the gender gap and securing the rights of a bride, let alone dowry culture. It is pertinent that civil society coupled with media should take pragmatic steps to elevate the status of women and in banning the dowry system. Hats off to the father of the bride who took the right decision and prevented the destruction of his daughter’s life.